Size: Cheirurus is 3.4 inches long! 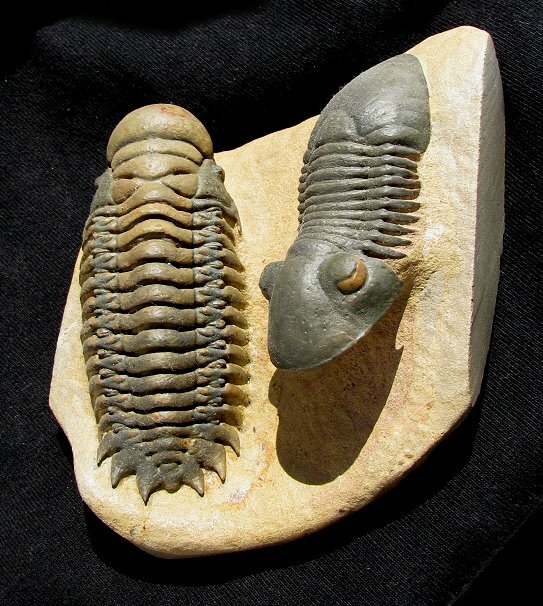 This is a breathtaking trilobite double from the Devonian of Morocco. There are two different types of trilobites on the block. Both trilobites are natural to the piece - there has been no compositing done to this magnificent specimen. A beautifully outstretched Paralejurus hamlagdadicus is on one side of theplate. This 3-dimensional trilobite has the brim of the head prepared in a free-standing manner for optimal display. On the other side of the slab is a very inflated and 3-D Cheirurus (Crotalocephalina) gibbus. The very tips of the sharp tailspines have been prepared in a free-standing manner, which is quite striking. Both trilobites have excellent detail preserved. The colorful trilobites contrast well with the lighter-colored matrix. The large bugs are beautifully showcased on the sculpted block of dense limestone. This is an outstanding display specimen of two different trilobites that are extremely well preserved - this is a very collectible fossil!